Her popular cookbooks, Martha Stewart Living magazine and television show of the same name have led many to dub Martha Stewart, 69, the doyenne of domesticity. Yet Stewart's home and lifestyle empire had humble beginnings in Nutley, N.J., where her mother taught her how to sew, cook and craft at an early age. After a brief stint as a stockbroker, Stewart began a catering business with a friend. Her relationships with publishing clients soon led to a book deal. 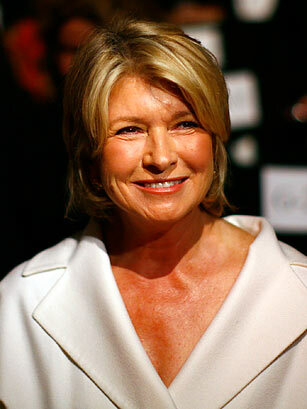 In 1997, Stewart channeled her various ventures into a single company, Martha Stewart Living Omnimedia, which went public in 1999 and made Stewart a billionaire in the process. Stewart faced scrutiny after insider-trading allegations in 2001, for which she would eventually serve a five-month prison stint in 2004. After her 2005 release, Stewart bounced back with a Kmart home-goods collaboration and a new TV show, The Apprentice: Martha Stewart. Her design sensibility is ubiquitous, having won her millions of dedicated followers and no shortage of detractors and parodies. Stewart has crafted decorations for both Presidents Barack Obama and Bill Clinton, while her company has expanded in recent years to launch Martha Stewartstamped houses, floor coverings, wines and even video. Over the past two decades, Stewart's influence on the way people entertain, decorate, cook and design has been unparalleled. See Stewart in TIME's top 10 CEO scandals.